I thought it was appropriate for me to pay homage to Nina Simone as a premise to this blog. Afterall, I am using one of her song as a title to my blog. My affinity for jazz has run even deeper when I first heard of Nina Simone about 6 years ago. I have been a big fan of Ella Fitzgerald, Louis Armstrong, and Billie Holiday (amongst many others from this jazz era). And occasionally, with the likings of Diana Krall and Norah Jones who atleast represent my generation. I don't really know much about her at one point. But her soulful renditions had brought me into reading more about her. I'm not sure now that I'm really all that much interested in her history compared to Satchmo's (Louis Armstrong) life - whom I was completely enthralled with. With Nina, it is the singing that got to me -- the raw voice that place you on a spell. 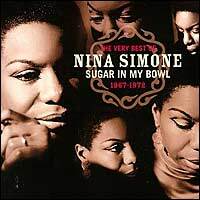 "My Baby Cares For Me" is the first Nina Simone song that I instantly fell in love with. And even my then 9 month old son would actually dance and move everytime he heard this song. I hope you will enjoy the song as much as I do. It's so weird. I'd never heard of this song, and then yesterday, I was reading the book "Goodnight Nobody" by the lady who wrote "In Her Shoes" and the lyrics to that song were in the book. I was like, "Oh! That's where Sugarmama got her blog title!" And then I saw this post today. Too weird!